Chinese Internet firm Tencent is best known for its popular messaging service WeChat, but one of its other products — a Vine-like app that features eight-second videos on loop — has been quietly gathering steam in China. The app, Weishi, which is only available in Chinese for now, chalked up 160 million video views in a single day on Valentine’s Day this year, which also coincided with the Chinese Lantern Festival. Tencent says that “millions” of the video clips were also viewed outside the Weishi app itself, via services such as Weixin (the version of WeChat available in China) and mobile IM platform QQ — testifying to the reach that Tencent has in China with the presence of its social platforms. This milestone followed a similar surge in popularity during Chinese New Year, though there were no specific number of video views provided for that period. Tencent says that videos were commented, shared and liked more than 100 million times on the eve and first day of the festival. Recording a video on Weishi is exactly like how you’d do it on Vine or Instagram — tapping and holding on to the screen starts your recording, while releasing it stops the recording. 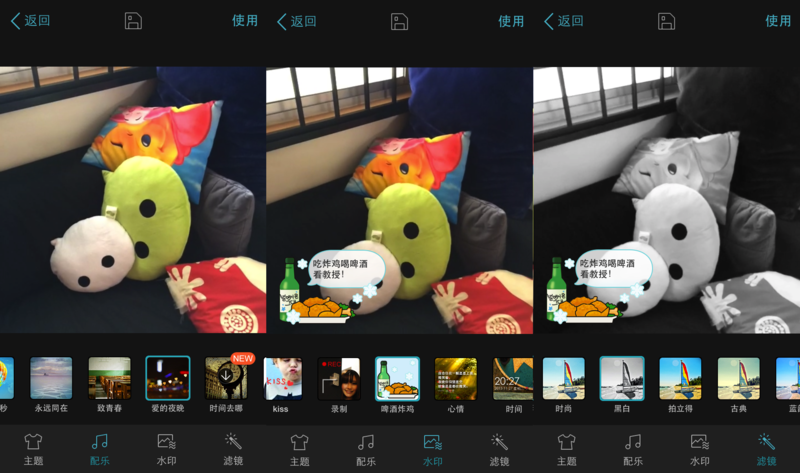 There are additional bells and whistles on Weishi though — other than filters, which Instagram also has, Weishi lets users add background music and watermarks to their videos. They can even choose from six themes that come with preset music and watermarks. 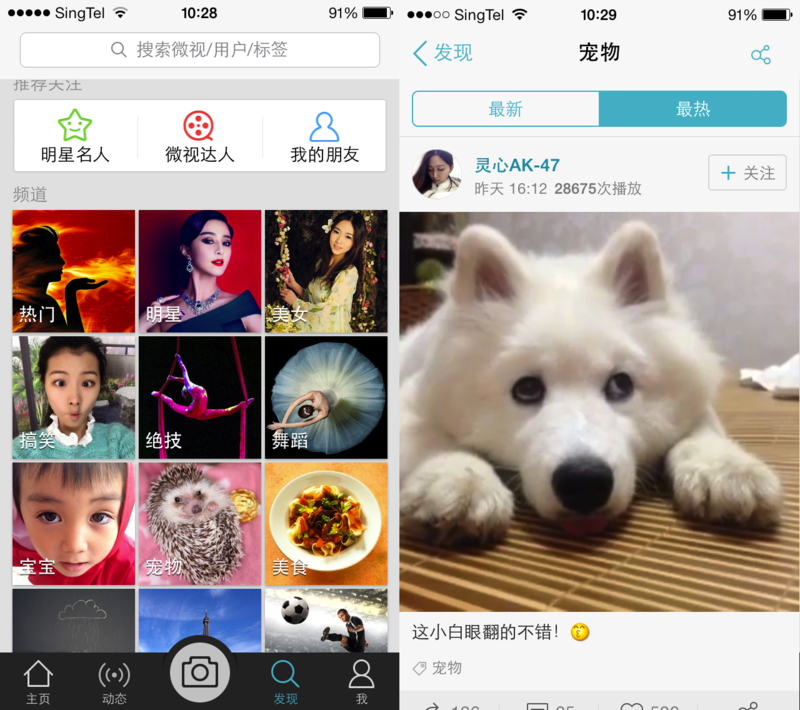 For viewing videos, Weishi employs a more visual format than Vine by displaying thumbnails for its video channels. Clicking on a particular channel brings you to a page where you can filter either via the most-recent or most-popular videos. You can also choose to follow someone immediately via an icon right next to the video, instead of being directed to a profile page like Vine does. As per Tencent’s other social services, recruiting celebrities and brands is a huge part of its strategy to appeal to users. More than 1,000 celebrities have set up Weishi accounts to interact with their fans, Tencent says. Weishi was launched in September last year, and according to data tracker App Annie, it has been ranked among the top three most downloaded social networking apps in Apple’s App Store in China from December 27, 2013 to February 25, 2014. There is much potential for Weishi in China, given that Vine still does not have that much of a presence in the country given its link to Twitter — which is blocked in China. Furthermore, short-video sharing could be an invaluable add-on to WeChat in the long run, taking a key role in helping the chat app evolve to become a social platform. WeChat’s rival, Japanese messaging app Line, already took a step in this direction last year by adding Snap Movie — a Vine-like feature that allows you to create 4-10 seconds of video clips with your choice of background music and can be posted to your in-app timeline, where they will be played on loop automatically.